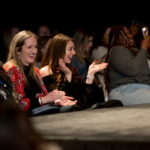 NIU’s Fashion Industries Organization staged a Work Day to Runway fashion show April 7 at the Duke Ellington Ballroom, Holmes Student Center. Students modeled fashions provided by Kohl’s, the show’s sponsor. (Click images to view larger.) Fashions featured in the show have been donated to the NIU Gender and Sexuality Resource Center where they will be available at their Annual Clothing Expo event. The event, which will be held in the fall, allows people to “shop” for interview clothing free of charge. 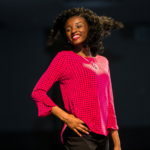 Deja Shaw rocks the runway in the Work Day to Runway fashion show. Jadakess Neal rocks the runway in the Work Day to Runway fashion show. Tyonna Wilson rocks the the runway in Work Day to Runway fashion show. Diego Cortez Rios rocks the runway in the Work Day to Runway fashion show. 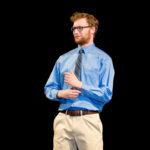 Ryan Janovic rocks the runway in the Work Day to Runway fashion show. Katrina Volkening rocks the runway in the Work Day to Runway fashion show. NIU fashion merchandising alumni Caroline Sullivan and Joanna Kline enjoy the show at the Duke Ellington Ballroom, Holmes Student Center.